Dorothee and Siobhan stand by the purpose built boiler and wood pellet store house. Glas Energy was engaged by Camphill Community Thomastown to assess the heat demand of two houses and a self contained apartment on a site in Thomastown, County Kilkenny. We designed an appropriate biomass heating system to meet this demand. Camphill is a worldwide organisation creating opportunities for people with special needs. The houses and apartment in this case study are home to community members. This community energy case study is just one of a number of similar projects that Glas Energy has been proud to work on within Camphill Communities. The heat load consisted of 2 buildings. One of these was a 3 bedroom house with a one bedroom apartment attached. The second building was a three bedroom house. The buildings were previously heated by external oil boilers. The residents complained of the smell from the boilers. Also, they noticed an immediate drop in temperature inside the houses when the heating went off. Glas Energy engineers recommended general energy efficiency fabric upgrades to the houses. We calculated the projected heat demand based on the expected building energy rating, post upgrade. A HDG-K boiler was specified with a 1000 litre buffer tank. Glas Energy and HDG designed a bespoke timber building which can be seen above. This building houses the boiler house and the purpose built wood pellet hopper and vacuum feed system. The fabric upgrades consisted of external wall and attic insulation and replacement of windows and external doors. 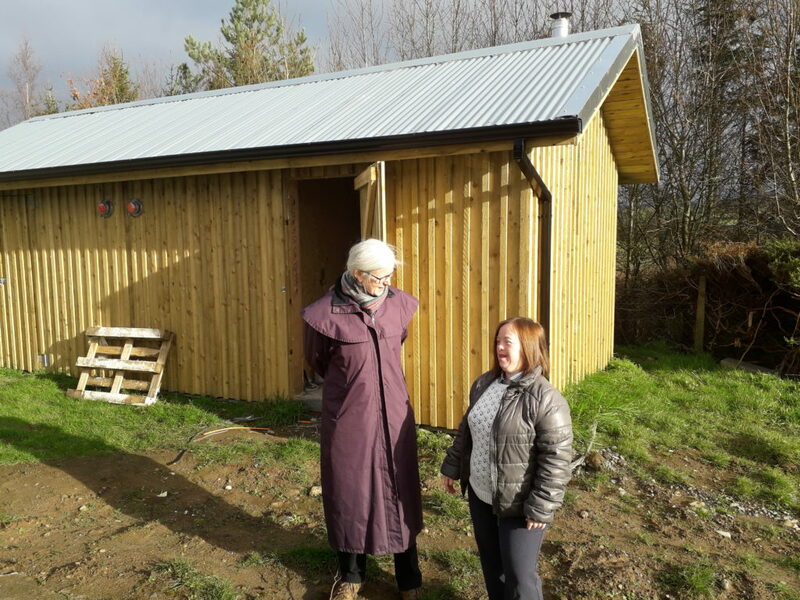 “There is a lovely even heat now and we can easily control it.” So says Siobhan O’Mahony, one of the residents enjoying the heating upgrade to her shared home in Thomastown, Co Kilkenny. Dorothee Beniers manages the community and says that she notices a ‘huge’ difference in the level of comfort. “In the old situation there was a bad smell from the oil boiler and once it was turned off the house was cold again almost immediately. This is very different. We are warmer and it all just feels newer and more comfortable” adds Siobhan. The Glas Energy team managed the complete installation of all of the components of the heating system. This included the stainless steel flue, the distribution pipe work to deliver the heat to the buildings and the installation of the heating control system incorporating full zoning of both buildings. Glas Energy has built a solid relationship with Camphill Community, where HDG boilers now provide heat to residents in 4 of their communities. This project received funding under an SEAI Better Energy Communities programme co-ordinated by DaysE – Donate as you save Energy.